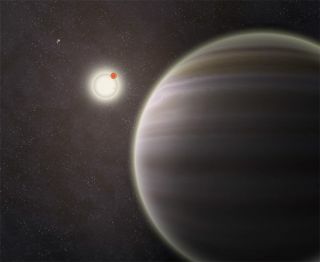 An artist's illustration of PH1, a circumbinary planet with two parent stars and twom more stars orbiting the entire system; PH1 was discovered by volunteers from the Planet Hunters citizen science project. Image released on Oct. 15, 2012. Amateur astronomers have helped discover an alien planet with two suns and a twinkling twist: The entire twin-sun setup, a real-life version of Tatooine from "Star Wars," is orbited by two more stars — a solar system that is the first of its kind known. The alien planet, called PH1, is a gas giant planet slightly bigger than Neptune. Its discovery in the midst of a strange, four-star planetary system is the first confirmed world discovered as part of the Yale University-led Planet Hunters project, in which armchair astronomers work with professional scientists to find evidence of new worlds in the bountiful data collected by NASA's Kepler space telescope. "Planet Hunters is a symbiotic project, pairing the discovery power of the people with follow-up by a team of astronomers," said Debra Fischer, a professor of astronomy at Yale and planet expert who helped launch Planet Hunters in 2010, in a statement. "This unique system might have been entirely missed if not for the sharp eyes of the public." In this family portrait of the PH1 planetary system, the newly discovered planet is depicted in this artist's rendition transiting the larger of the two eclipsing stars it orbits. Off in the distance, well beyond the planet orbit, resides a second pair of stars bound to the planetary system. Released Oct. 15, 2012. Since its initial discovery via Planet Hunters, the existence of PH1 has been confirmed by a team of professional astronomers, who will present their work today (Oct. 15) at the annual meeting of the Division for Planetary Sciences of the American Astronomical Society in Reno, Nev.
With a radius about 6.2 times that of Earth's, PH1 is a smidge bigger than Neptune. The gassy planet spends 138 days completing a single orbit around its two parent stars, which have masses about 1.5 and 0.41 times that of the sun. The stars circle each other once every 20 days. If you're hoping to catch the quadruple sunset, this may not be your best bet. The researchers estimate PH1's temperature would range from a minimum of about 484 degrees Fahrenheit (524 Kelvin, or 251 degrees Celsius) and a maximum of 644 degrees F (613 Kelvin, or 340 degrees C), too hot to be in the habitable zone. "Although PH1 is a gas giant planet, even if there is a possibility of rocky moons orbiting the body, their surfaces would be too hot for liquid water to exist," researcher Meg Schwamb of Yale University and colleagues write in a draft of their research article. Until now, scientists had identified just six planets orbiting two parent stars, called circumbinary planets, and none of these have stellar companions orbiting them. Until their discovery, circumbinary planets were once the realm of science fiction with Tatooine, the fictional homeworld of Luke Skywalker in "Star Wars," among the most famous. "Circumbinary planets are the extremes of planet formation," Schwamb said in a statement. "The discovery of these systems is forcing us to go back to the drawing board to understand how such planets can assemble and evolve in these dynamically challenging environments." The Planet Hunter volunteers, Kian Jek of San Francisco, Calif., and Robert Gagliano of Cottonwood, Ariz., spotted PH1 using the transit method, noticing faint dips in light as the plant passed in front of, or transited, its parent stars. Gagliano said he was "absolutely ecstatic" about the finding. "It's a great honor to be a Planet Hunter, citizen scientist, and work hand in hand with professional astronomers, making a real contribution to science," he said. Jek, too, expressed his amazement. "It still continues to astonish me how we can detect, let alone glean so much information, about another planet thousands of light-years away just by studying the light from its parent star," he said in a statement. Schwamb led the team of professional astronomers who confirmed the discovery and characterized the planet, following observations from the Keck telescopes on Mauna Kea, Hawaii. For more information on the Planet Hunters project, visit: http://www.planethunters.org.